Learn traditional and modern upholstery, polishing and renovating skills by creating a piece of fine furniture to take home. You will be using top quality materials and working from a solid hardwood frame. With no more than 7 students in the class you will gain a broad range of skills realistically enabling you to not only create a fabulous piece of furniture to take away with you or give as as gift but also to tackle similar projects. 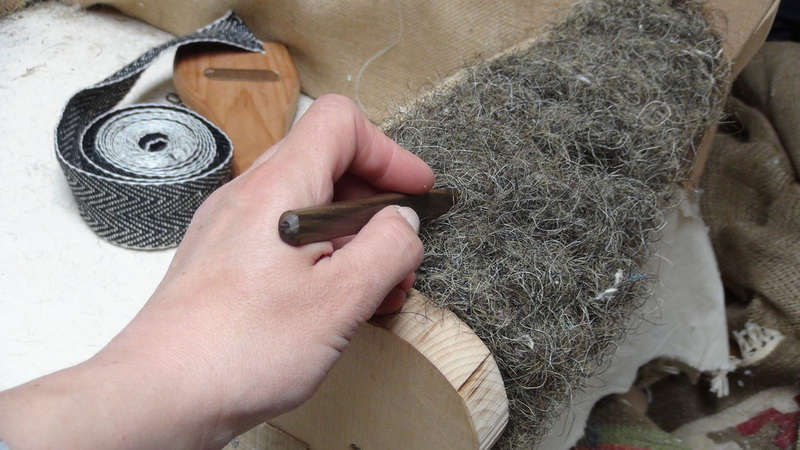 In ths course you will learn the fundamentals of traditional upholstery, top cover work and trims with options to acquire further skills such as deep or float buttoning and how to hammer in studs. See course details below for further information or to book. This course is held in the picturesque rural setting of Applegarth Farm on the outskirts of Grayshott, opposite Grayshott Spa. Applegarth has a beautiful garden restaurant and coffee shop, farm shop and delicatessen with varied events throughout the year. All tools, frames and materials, except your choice of fabric are provided. I can source suitable fabric and designs for you, simply get in touch. Fabric and tool kits are available to purchase from my studio at Applegarth. The next Beginners' Courses will run in June 2018 Book your course by clicking on the course dates. To register your interest for future courses call Patricia on 07816 290804, or for any queries on dates, times or course content, please email below and sign up to our newsletter for updates.